Holiday Traditions of Denmark - "Glædelig Jul og godt nytår"
The main festival of the year in Denmark is Christmas (Jul). Danes celebrate Christmas Eve on December 24 and prolong the Christmas through December 25 and 26. Though many longstanding traditions have disappeared over the years, many traditions such as the family gathering at Christmas, lighting Christmas tree candles, and the month-long calendar candy are still celebrated today. On Christmas Eve, after a splendid of traditional goose, Danish families light candles on the beautifully decorated Christmas tree. After dancing round the tree, singing traditional songs, the members of the family exchange gifts. Some of the family will probably have attended church services in the afternoon. Christmas in Danish is called Jul, an old Nordic word for "feast", and it is the biggest holiday in Denmark with traditions that go back centuries. A Danish Christmas of old times. Christmas and the way it is celebrated in Denmark has a long history. Even before the birth of Christ, the concept was known in the Nordic countries and some of the customs of Christmas has been carried into our time. A nice, sumptuous Christmas dinner for example. In the Middle Ages, after the Danes had been Christianized, catholic traditions mingled with the old Nordic ones especially in the cities, and the custom of candles was adopted. Candles along with food and money were given to poor people as charity. Today, Danes still refer to Christmas as the feast of the candles. In the countryside very little changed. Christmas was still a pagan feast and a lot of superstition was associated with the celebrations. Christmas was believed to have magic powers. Bread was left on the table during the holidays and in Spring it was spread on the fields before the sowing in order to get a good harvest. After the reformation in 1536, the Church tried to get rid of the old customs - pagan as well as catholic - and to Christianize Christmas. Even though people did not let go of their old traditions, some change took place during the next two centuries. Christmas remained the major holiday and a lot of preparations were made during December. In the countryside they butchered, baked, brewed and made candles and everything was cleaned inside as well as outside. Finally, everybody had their Christmas bath. Christmas was a time when people as well as animals were cared for. Sheaves were put in trees for the birds to eat and the domestic animals got a little extra in their cribs. Furthermore, all kind of work was banned during the holidays. Christmas gifts were not yet common even though it started to gain popularity in the cities, but servants and employees were given a bonus like big Christmas breads or small cakes of batter cooked over the fire in a special kind of pan. 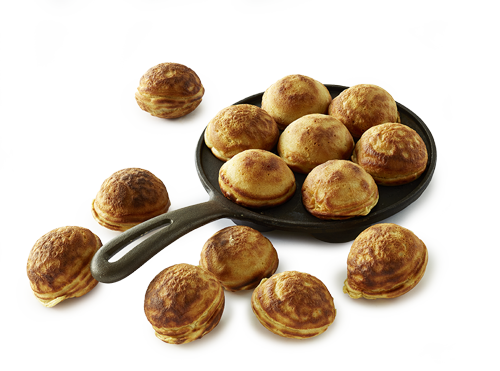 These cakes are called "apple slices" (æbleskiver) and are still eaten at Christmas in Denmark along with a hot punch called glögg made of red wine, a squeeze of brandy or snaps and with raisins and pieces of almond in it. In those years, Christmas was recreated and made into a big event centered around the family. It was seen as a way to broaden the national awareness by strengthening our traditions and as an event the Danes could gather around. As a consequence a lot of new customs was introduced. Detail of a Typical Danish Christmas Tree First of all, the Christmas tree came along, decorated with paper decorations, fruit, sweets, candles and small Danish flags. The whole concept of Christmas trees was imported from Germany. Also, Christmas gifts became common along with Christmas cards and the Christmas "nisse," a small Danish mythical creature that you definitely want to stay best friends with, since he is able to control your fortune. Hence the tradition of putting porridge out for the nisse on Christmas Eve. The nisse was usually a small, old man with a white beard, dressed in a grey sweater, grey trousers, a red pixie cap, red stockings and wooden shoes. He was believed to live hundreds of years. As Christmas today is a family time, also the nisse has a family now. In the beginning of the 20th century, Santa Claus and the stories surrounding him came to Denmark from the USA. From Great Britain came the mistletoe and holly. After the Second World War the Christmas Calendar, the wreath of Advent and the Lucia parade was introduced, and Christmas as it is known today took shape. 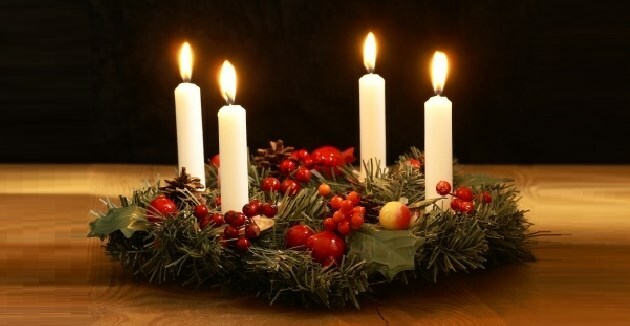 Advent Wreath In Denmark, Christmas starts with advent which means "coming". It is the coming of Christ that is referred to. Originally it was also a time for fasting and doing penance and thereby preparing yourself for the Christmas feast. On the fourth Sunday before Christmas Eve - the first Sunday of advent - a advent wreath (adventskrans) of pine twigs mounted with four candles and red or purple ribbons is hung up and one candle is lit. The following Sunday the next candle is lit, lighting one more each Sunday. This tradition is the first sign of Christmas approaching should you not have noticed the huge amount of Christmas decorations and displays in shops and malls, not to mention the colorful Christmas catalogues you have found in your mailbox since the beginning of November. Christmas Calendar The first of December is the first day of the Christmas month, and it is therefore the day to start opening your Christmas calendar (julekalender). Every kid has one and there is a wide variety of them. Some are made of paper and filled with chocolate hidden behind 24 small windows allowing one piece each day until December 24. Others have small pictures behind the windows and yet others are embroidered ones with little gifts tied to them. A unique tradition in Denmark is the Children's Developing Country Calendar. It can be bought in banks and post offices and the profit goes to children in a chosen developing country in the third world. One of the great Danish traditions is the "Children's Christmas Calendar" which is a television show made by Danish television. Most years a new one is made. Every day from the first of December to the 24th of December, a new episode is shown on television. Usually it is a Christmas story or fairytale either with real people performing or with puppets. In the later years, there has been a tradition for an adult Christmas calendar on television as well. Usually a humorous one. Calendar Candle The first of December is also the day to light your calendar candle (kalenderlys), a candle marked off in 24 divisions, one for each day until Christmas. During December all the preparations for the holidays begin. One of the bigger jobs - and expenses - is buying your Christmas presents for friends and family. Giftwrapping used to be a family event, done by the whole family on a December evening, but nowadays the shops and stores have pretty much taken over. A tradition that on the other hand seems to be intact, is writing relatives and friends a Christmas card wishing everybody a merry Christmas and a happy New Year. When you post it you usually put on a Christmas seal that looks like a stamp but does not have any value in itself. Instead the profit of the sale is used for charity work. Every year the Christmas seal is designed by a different artist and in 1970 it was designed by the Queen. On December 13, the Lucia processions take place at most schools, hospitals, rest homes and other institutions. Children, usually from the various school choirs, are dressed in white and each carry a candle. One child gets to be the Lucia bride. On her head she wears a wreath of fir with candles in it and she is leading the procession. All the lights are then switched off and the whole parade walks the aisles, singing the Lucia song. Lucia was the saint of the light in the catholic church and her remembrance day is December 13. The Lucia procession originated in Sweden and gained popularity in Denmark after the Second World War. As Christmas Eve approaches, a number of other things must be attended to and taken care of. One is the making of all sorts of Christmas decorations for the house and the Christmas tree. Though all families keep their decorations from year to year, new ones are nevertheless almost always made each year, often because the children wish to. Christmas Hearts A special Danish tradition is the Christmas heart (julehjerte), an interwoven paper heart often made of red and white paper, the colors of the Danish flag. 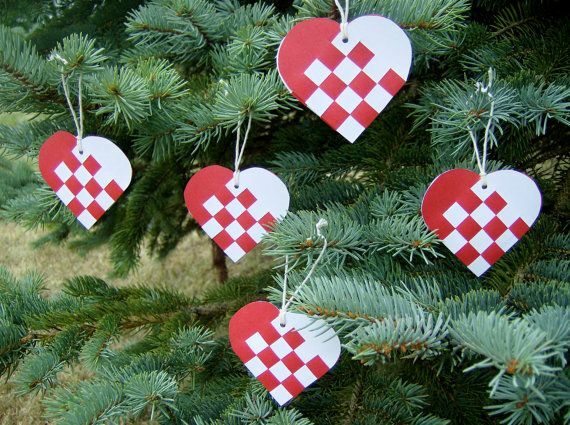 These paper hearts are put on the Christmas tree or used as mobiles. Once the decorations are ready it is time to get a Christmas tree. Most people buy their tree at the nearest mall or grocery store, but some still spend an afternoon in the forest, selecting and eventually chopping their own tree. In most homes the tree is kept outside until the day before Christmas where it is taken inside and decorated. Usually the whole family helps, but sometimes the adults do it on their own in order to surprise the children on Christmas Eve. The Christmas tree is not only found indoor, though. Christmas trees are also part of the decorations of towns and cities, and a really tall tree is usually placed at the city square or in front of the city hall. On the first of December, the electric lights are switched on and they are lighted every day in December. Food has always been an important part of the Christmas celebrations, and even though you can buy all you need in shops and grocery-stores, at least some of it is made at home. Normally cookies and sweets are made together with the children and are part of the Christmas preparations. Traditional Christmas cookies are vanilla wreaths, brown cookies with cardamom, cinnamon and candied peel, "klejner" which are cakes cooked in oil or fat, and small, hard biscuits called pepper-nuts. Some people also make honey-cakes in all kinds of shapes decorated with white icing. These may even be used as Christmas decorations. Sweets are also made at home in many families, especially chocolates. Marzipan, nuts, nougat, dried fruit, almond, liquors like brandy, rum etc. are typical ingredients. You then make your own chocolate covered marzipan bars and all other kinds of small sweets. Christmas Beer Danish people also has a great tradition for Christmas lunches - though they are often held in the evening! This "lunch" is usually hosted by the employer and celebrated with your colleagues at the workplace, but may also be a get together with friends and relatives. Most people go to at least a couple of Christmas lunches during December. The traditional Christmas lunch foods are herrings with a kind of curry-salad with eggs followed by stewed curly cale with ham and sausages. The meal often ends with cheese and biscuits or just fruits and sweets. Beer, usually specially brewed Christmas beers (julebryg) that are only sold at Christmas time, and snaps is almost always served. Although this menu varies and is not identical all over the country, the purpose of having a Christmas lunch is the same. The whole idea is basically to have a good time, a nice meal and to wish your colleagues a merry Christmas and a happy New Year. Since it is a party without your family and spouse, these lunches have gained the reputation of being kind of a wild and unrestrained event. Be that as it may, it is an event looked forward to by most people and an un-escapable tradition at most workplaces. Glögg Another Christmas time event taking place throughout December is having people over for glögg and "apple slices" (æbleskiver). 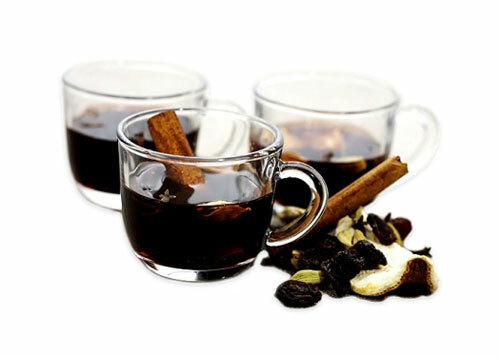 Glögg is originally Swedish and basically hot red wine and a squeeze of brandy or snaps, and with cinnamon, cardamom, raisins and pieces of almond. Glögg is served with a small hot cake of batter called "apple slices" even though they do not contain apple anymore. It is eaten with jam and sugar or icing sugar. In some families glögg and "apple slices" is a "Little Christmas Eve" (lillejuleaften) tradition. The "Little Christmas Eve" is the evening before Christmas, in Denmark the evening before December 23. Danish æbleskiver Other traditional Christmas food eaten throughout December are oranges, clementines, nuts and apples. For lunch liver paste, meatballs, Christmas ham, herrings, sausages and pate are common dishes. As for drinks and beverages, a special Danish tradition is the various Christmas beers brewed and sold only at Christmas time. Every single brewery has their own special Christmas beer with names like "snow beer", "X-mas", "Christmas brew" etc. Snaps is also a major Christmas liquor, and like the Christmas beers, a special Christmas snaps is produced every year. The last days before Christmas are spent buying the few presents remaining, preparing food, hoping for the snow to fall if it is not yet there and thousands of other small things. On December 24, all shops close at noon so everything must be taken care of and bought before this deadline. 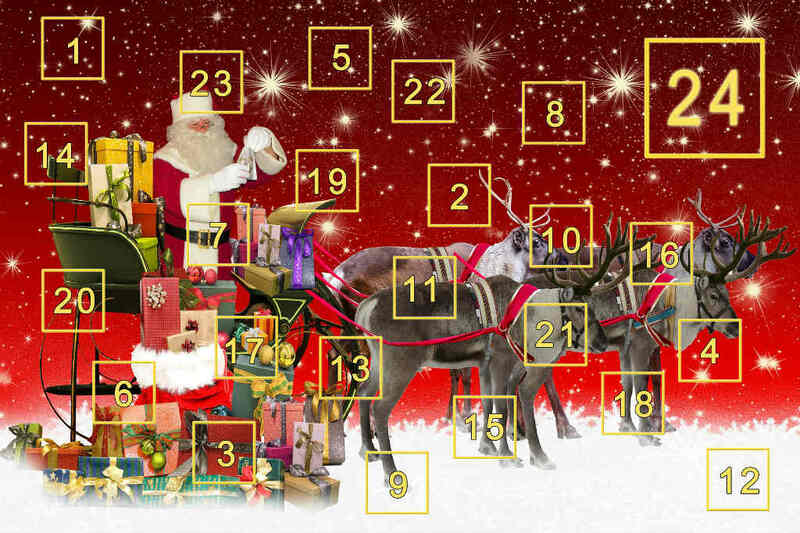 The day of Christmas Eve, December 24, is one long wait if you are a child and probably quite busy if you are an adult. Christmas dinner is prepared and some families go to church in the afternoon to hear the Christmas Gospel about the birth of Jesus. In order to entertain the children, the Disney Show "From all of us to all of you" is on, along with other cartoons and television shows making the waiting more bearable. Finally, in the evening, Christmas dinner is served and it too has a lot of traditions attached to it. Ris A La Mande Some families start with rice pudding (Ris A La Mande) with cherry sauce. A whole almond is hidden in the pudding and whoever gets the almond receives the almond present, traditionally but not necessarily a marzipan pig. Afterwards most people have either duck, pork roast, turkey or goose served with sugar glazed potatoes, gravy, and cooked red cabbage (rødkål). 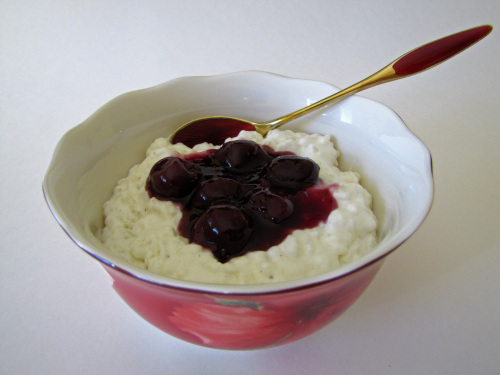 If you did not start with rice pudding, you have a kind of cold rice pudding for dessert along with cherry sauce and, of course, the whole almond. Christmas beer, a sweet beer with very little alcohol, or juice is served with the porridge and red wine is common with the main course. 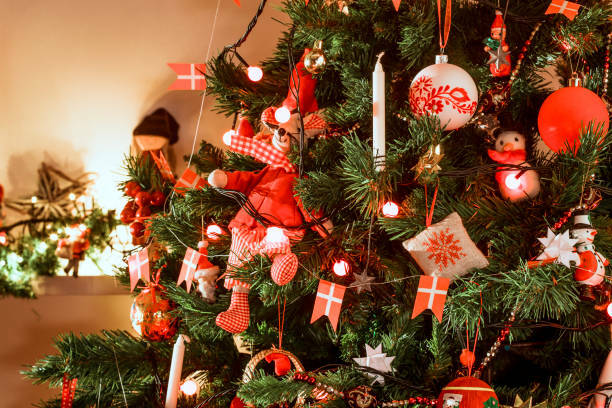 After the Christmas dinner it is time to light the tree, walk around it and sing the Christmas carols, some of which are known all over the world but most are traditional Danish (see a short list with links below). Click here for lyrics for "Dejlig Er Den Himmel Blå"
Click here for lyrics for "Det Kimer Nu Til Julefest"
Click here for lyrics for "Glade Jul, Dejlige Jul"
Click here for lyrics for "Højt Fra Træets Grønne Top"
Click here for lyrics for "Nu Har Vi Jul Igen"
Finally the presents are opened, and when the unwrapping is done, it is time for coffee and sweets before bedtime. On Christmas Day, December 25, most people have lunch or dinner with relatives in order to celebrate Christmas with the whole family. Christmas Eve is usually just an event for the children, their parents and grandparents. The second day of Christmas, December 26, is often spent at home, relaxing after the last hectic days.